Contemplative arts comprise a number of secular disciplines and activities that integrate art and culture with everyday life. Each of these represents a genuine contemplative path; together they bring beauty, vividness and wisdom to our lives and culture. The following summaries are a sampler. Shambhala Art can be seen as a process, a product, and an arts education program based on the Dharma Art teachings of Chögyam Trungpa Rinpoche. As a process, it brings awareness to the creative and viewing processes through the integration of contemplation and meditation. As a product, it is art that wakes people up. The program explores the creative process and the product we call art from the point of view of clear perception and pure expression. 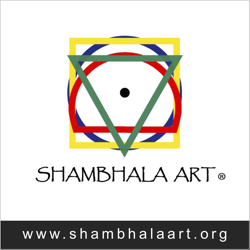 Learn more at www.shambhalaart.org. In 1982, Chögyam Trungpa Rinpoche formed a new school of ikebana (Japanese flower arranging) inspired by his own training and vision. Kalapa Ikebana, as this school is called, promotes the study and practice of flower arranging, often working closely with masters of other schools of ikebana. Learn more in this video: Born in a Broken Heart: Ikebana, a Smile Mixed with Tears. Miksang is a Tibetan word that means “good eye.” This discipline is based on Chögyam Trungpa Rinpoche’s teachings on the nature of perception. Incorporating visual exercises and photographic assignments, it is ultimately about seeing with our eyes wide open and our awareness fully present. Learn more at www.miksang.org; see also posts tagged contemplative photography on our News Blog. The simple act of putting ink on paper can be a direct way to see our mind. Fear, hesitation, confusion, our state of mind manifests on the page as we move the brush in our hand. The creative process of calligraphy enables us to see our obstacles and work with them, through the synchronizing of mind and body. This practice is based on the principles of the five buddha families, each of which expresses a particular style of openness. Maintaining a posture associated with each family in five specifically designed environments heightens the characteristic patterns of energy of each family, so that both the neurotic and sane aspects of the student’s personal style become apparent. Learn more at shambhala.org/programs/contemplative-arts/maitri. This awareness practice is based on postures and movement from traditional Tibetan monastic dance. Simple yet demanding, these techniques train students in synchronizing body and mind, in relating with space, in maintaining awareness during intense activity, and in communication. See also www.mudrainstitute.net.